Just because VVC was over didn't mean that everything was. 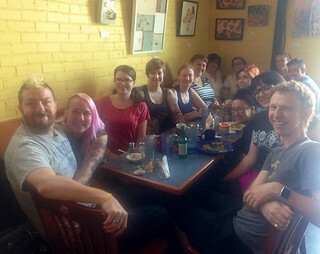 The next day I met up with a group of people for brunch at the famous Bouldin Creek Cafe. I couldn't say no to the famous Rennedict, which I had with a side of very juicy grapefruit. This was AMAZING! 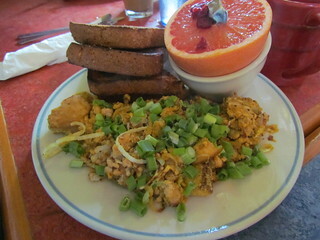 This place has the best tofu scramble in the world, each bit was coated in delicious noochy goodness. I still dream of this. I also tried a little bit of delicious potato and leak scramble. 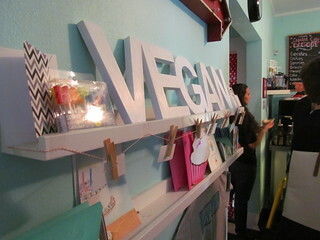 Bouldin Creek is very close to Rabbit Food Grocery, which is such an awesome place, and is probably my favourite vegan store ever! 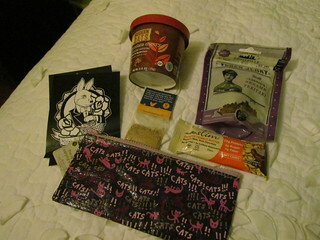 I didn't have much room to buy all the wonderful things I could have, given that I had all my swag bag goodies to pack and flight baggage limits to stay under. But I bought a few fun things. Afterwards we went to Thai Fresh to check out their vegan ice cream options. Unfortunately their ice creams had a very heavy coconut base, and after a sample I could tell it would be too much coconut fat for me. 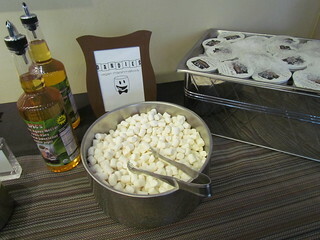 They had a lot of fun flavours that other people tried, and the tamarind flavour I sampled was pretty great. Luckily they also had a case full of vegan desserts. 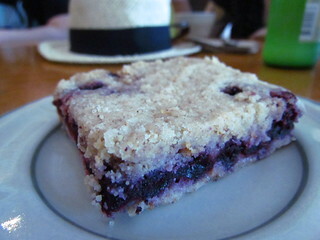 I had a a lovely blueberry crumble slice with an iced chai. 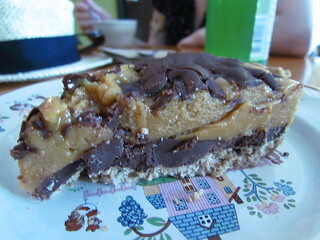 Jojo ordered a peanut butter caramel chocolate pie, which seems to be similar to the Smlove pie from VWAV. I tried a tiny bit, it was great but so rich! I had a free afternoon then, so I decided to get some culture at the Bullock Texas State History Museum, turns out that Texas has quite the history! It was a Republic briefly! Lots of people killed each other! 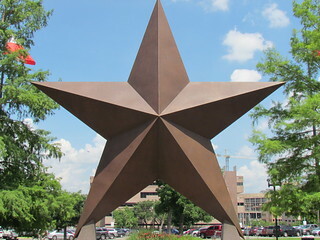 There is a really big star there! There was also a pretty cool little exhibit about Roller Derby, which was fun. I was craving some vegetables for dinner, and Christy recommended Koriente. It was just what I needed! Especially after a bit of a walk to get there. Through a field of SQUIRRELS! (More ont hat ina later post.) 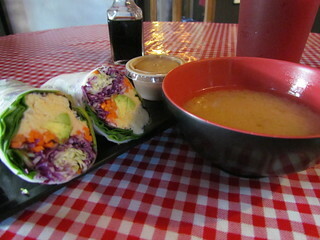 I started with a hummus roll that came with some peanut sauce, and a miso soup. 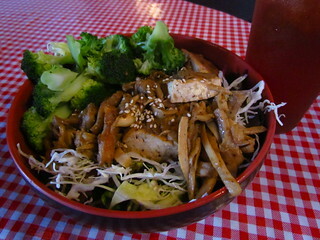 Then moved on to a Shiitake Tofu Bowl with brown rice and broccoli, because I love tofu and mushrooms. I also had an iced red tea, yum. After dinner I met up with some vegans at Rattle Inn for a Two-Step lesson as a Texas experience. It was fun, though I felt a bit awkward to after the lesson I was happy to watch. 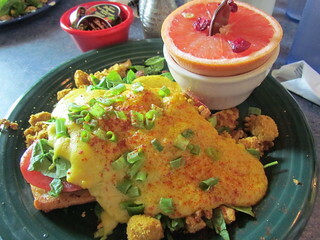 The next morning, my last day in Austin, I went out to Biscuits and Groovy for part one of breakfast. 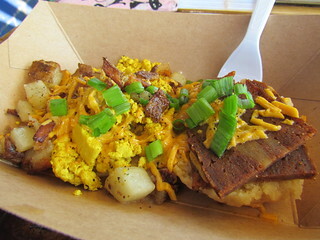 I had the MC Hammer (scrambled tofu, maple bacon, cheese and chives) with home fries. I only realised later I should have also have asked for a side of gravy so that I actually had biscuits and gravy! Breakfast part two found me back at The Steeping Room for the Vegan Breakfast Bowl with a side of Tempeh Bacon, and an Iced Spring Bud Chai (nutmeg and vanilla) on soy. The bowl had black beans, potatoes, greens and cashew sauce, and was nice. 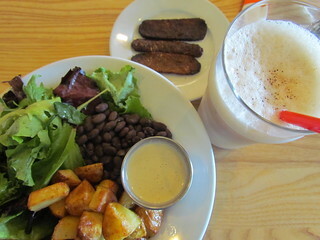 The tempeh bacon was good, but at $3 for three tiny strips of bacon was a bit steep! On my way back to the AirBnB, I stopped by Central Market, which is a pretty nifty grocery store with a lot of vegan things. And then I went back to pack, as I was getting up at stupid o'clock the next morning to leave Austin. And also to hang out in the aircon, because it was hot! My plan was to catch a bus to meet Kelly at Cherrywood Coffeehouse for afternoon tacos (it's a thing). However I accidentally waited at the slightly wrong corner and watched the bus go right by me. The next one didn't come for 40 minutes, so I power walked there instead. Hot!! Anyway, it was worth it to see Kelly and to enjoy a yummy tofu, avocado and potato taco. 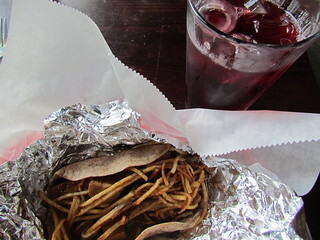 When they say potato, what they mean is shoe string fries! Yes please! I also had a hibiscus iced mint tea, because I was super hot after my walk! Kelly headed off to the airport, and I successfully managed to wait at the right stop to catch a bus back to my AirBnB and finish getting ready for the morning. 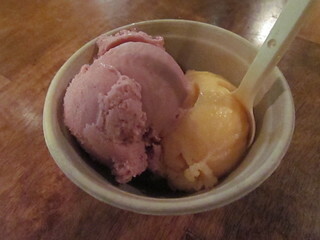 Then I headed out for pre-dinner ice cream (this is also a thing) at Sweet Ritual. This time I was going for some fancy flavours. 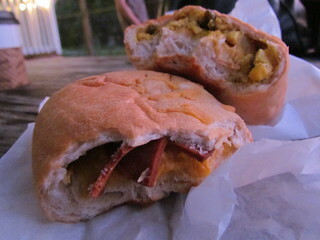 I had the Cinnamonkey Elephantastic, which is peanut butter, cinnamon and banana, with peanut shell. 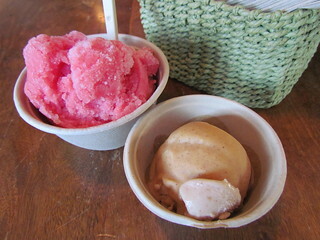 I also had a scoop of watermelon sorbet, which didn't scoop well at all but was so sweet and refreshing and delicious! 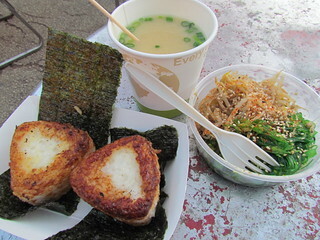 For dinner I tried out Love Balls, a vegan-friendly Japanese street food truck at Spider House. I got the Vegan Side Set, which had miso, grilled onigiri, seaweed salad and bean sprout salad. It was delicious! Then it was back home to try and get an early night for my super early morning! 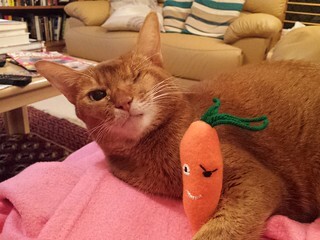 Sahara with the Panda With Cookie pirate carrot cat toy I bought for the girls from Rabbit Food. Sunday, day two, started with a walk through a park to the conference center for another great day. I was actually still kind of feeling full from the day before, and wasn't sure how I could possibly manage to eat. 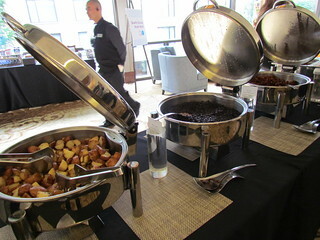 Then there was the breakfast buffet. Again I went with toast (my previous combinations and peanut butter on one and avocado and chevre on the other), with sides of scrambled tofu, chorizo, hashbrowns, coconut bacon, cheese slice and fruit. As well as some raspberry yoghurt and a grapefruit juice. The first talk of the day was 'Stop Breaking the Law, A$&h#*!' by Randi. This was fascinating, and also a bit scary in how limited the protection from the law is in some cases. Erika has done a great write up here. I wasn't entirely sure where to go for the next session, and wound up in 'Honesty in Your Online Presence' by Monique Koch. This talk wasn't quite what I was expecting, but it was completely amazing! Monique is such an open and honest person, there were tears, there was laughter. It was amazing. Definitely a highlight! You can find a recap written by (you guessed it) Erika here. Here I am with Cadry of Cadry's Kitchen in the break! It was great to meet Cadry. She lives in Iowa, which as any Buffy fan knows is where Riley Finn is from. The next talk was 'Tweet Like You Give a Damn: Social Media & Why You're Doing It Wrong (IMHO)' by Brian Patton, which was pretty hysterical. The room was packed out, I was lucky to get a seat right at the back. One of my favourite moments happened during this talk. I ended up sitting next to Lindsay and without a word, as we watched the talk, we started following each other on Twitter and Instagram. 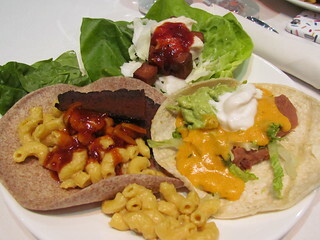 The theme of today's lunch was 'Vegans Heart Tacos', and they had a magnificent taco buffet for us! There were three suggestions for assembling tacos, which I took as a guide, though substituted as I needed for my preference. At the back is my version of the 'Korean' cowgirl, which had cabbage slaw, fried tofu, Korean BBQ sauce, garlic aioli and scallions. I committed a sin and left off the kimchi because I looked pretty spicy. I chose the lettuce leaf wrapping option here. Moving clockwise we have 'The Casual', which had lettuce, refried beans, guac, queso, pico de gallo and sour cream in a corn tortilla. And finally, the Westagram. Kale, mac and cheese, seitan bacon and Apple BBQ sauce in a wheat tortilla. Yes. it was as good as it sounded. I also took a little extra scoop of mac and cheese! I actually went back for more mac and cheese, but it was all gone because it was so good. Want to make some yourself? The recipe is here. Seems like it was made with coconut oil, so probably good that I didn't get to eat as much as I wanted! But if you would like to make me a big batch you can easily substitute that. Back to sessions, and I found myself in 'On-Location Photography' by Hannah Kaminsky, and picked up a few tips including how to use some settings on my camera that I didn't even know I had! There was also a Book Club breakout session at this time, which has been summarised by (yep) Erica here. I am glad she wrote a summary because now I can add lots of new books to my reading list! The next session I had been really looking forward to 'Veganism, Body Image, Self-Esteem, Eating Disorder Recovery, and how Blogging & Reading Blogs can Influence All of the Above' by Lacy Davis, however it was announced that Amey was hosting a pop-up class on Compassion, and I just had to go to that (don't worry, Erika summarises Lacy's talk here). Amey's talk was so beautiful, as she discussed her concepts of compassion and self-compassion and her favourite yoga sutras. There was a chance for people to talk about their own struggles, and there were many feels, and there were some tissues required. We had a surprise afternoon tea with these beautifully decorated sugar cookies from my very favourite Capital City Bakery. 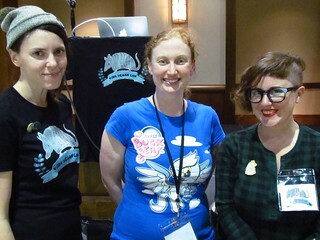 This is me with Nichole and Callie, who run a great podcast called Vegan Warrior Princesses Attack. Check it out! It was so fun to meet these two. And just like that it was the last talk of the conference. I was torn between 'Ethics of Vegan Dining & Boozing' by Bianca and 'Adventures in Vegan Travel Blogging' by Jojo. 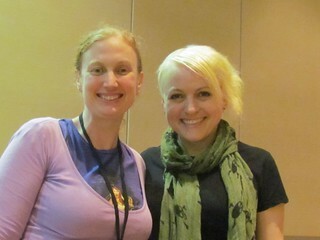 I ended up in Jojo's talk, which was a riot (I heard that Bianca's talk was great as well!). Erika, who is the greatest note taker ever, has done a write up of Jojo's talk here. You can also see Jojo's amazing 'Packing Like a Pro' video here. I'm pretty sure there is sorcery involved. Afterwards I took a photo with beautiful Amey. I think she might secretly be a unicorn. This was the final VVC, so the farewell speeches were particularly moving. Even though this was only my first VVC, I was still in tears. I only just found it! How can it be over forever? Why didn't I go to the other ones? This is something that is definitely worth traveling half way around the world for. Pretty much everyone was up on or in front of the stage by the end of this. And I can never hear Save the Best For Last or (I've Had) The Time of My Life again without crying. 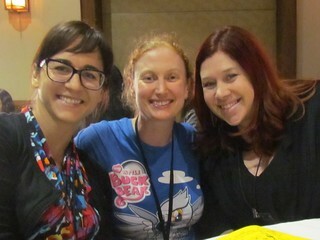 I had to get a photo with Jess, one of the organisers, and Jules, both of whom were so welcoming the entire conference. But it wasn't all over yet. The official after party was happening at Cheer Up Charlie's, home of the famous Arlo's, home of the famous bacon cheeseburger with a side of tots that I ate. I had been looking forward to this for so long, and it did not disappoint. It was so good! 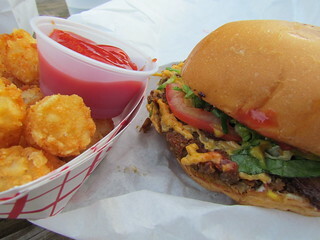 I love that the patty is homemade, and you can see lentils and stuff in it, it is such a great burger. Plus, TOTS! 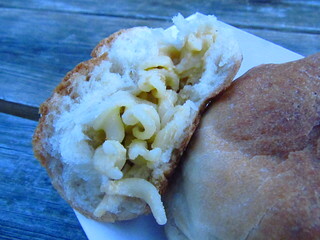 Bistro Vonish also had a pop-up there and I had this Mac and Cheese Kolache. It was a little strange, because the bread part was kind of sweet, but still good. 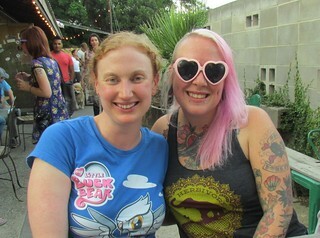 I had the opportunity to go and see the famous bats, so I didn't stay for the announcement of the Red Hot Vegan's VVC Scavenger Hunt winners (Jojo and Amey). We got down to the river where the bats fly across and waited. Unfortunately by the time the bats came out it was very dark so I couldn't get any sort of decent photo. 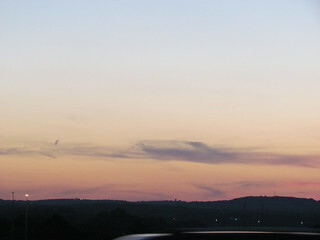 But here is a pretty photo of the sunset while we were waiting. Also unfortunately a cyclist got hit by a car behind us (the car drove off, jerk). We think they were mostly OK. But it certainly took the shine off the event. 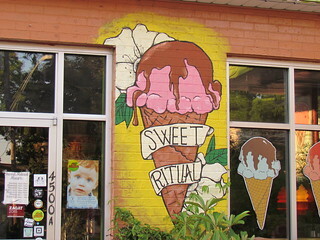 To settle out nerves, we went to Sweet Ritual for ice cream. Because I am a lame vegan, I got strawberry ice cream (I love strawberry) and peach sorbet, even though they had many ridiculous and exciting flavours there. That was just what I felt like. And they were great! 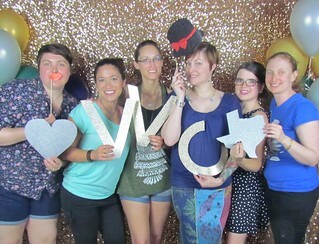 Then it was back to the after party for some final farewells (and some not so final ones) and a quick trip to the photo booth before it was time to go back to my AirBnB and sleep. 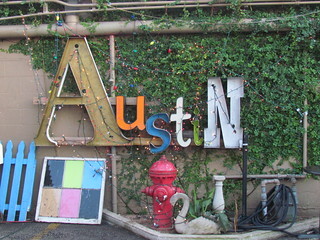 But don't worry, there was still a few more Austin adventures left. 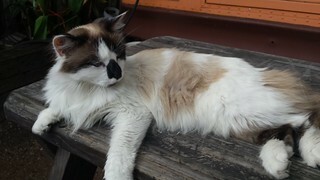 This cutie was lazing around the Spider House Cafe one evening when I was there. Very friendly. 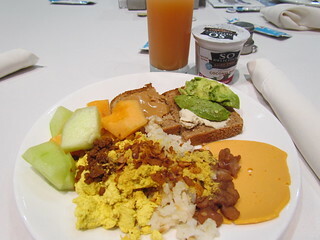 Saturday was the first day of the conference itself, and this conference included an awesome breakfast and lunch! 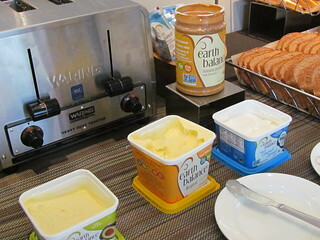 Breakfast was a Taco and Artisan Toast Buffet! It had everything, including Dandies for your coffee! Or, if you are like me and don't drink coffee, Dandies for your mouth! Even though it was Austin, I gravitated to the toast section for breakfast. 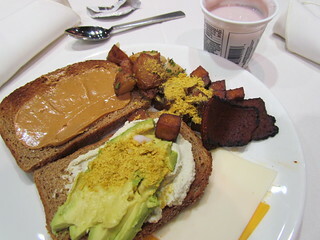 I had toast with Earth Balance peanut butter, and toast with Heidi Ho cashew chevre, avocado and nooch. I also had some sides, including tofu, roasted potato and delicious Sweet Earth bacon, as well as some sort of cheese slices, brand unknown. And a So Delicious Strawberry and Banana Coconut Yoghurt. 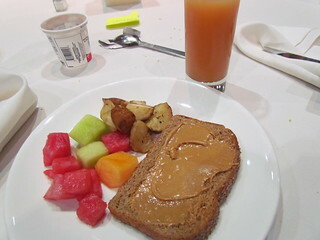 And then I went back for a second plate of more PB on toast and potatoes, but also some fruit salad and a grapefruit juice. And this is just what I had, there were all sorts of options to choose from! You can see a great round up of the breakfast options, including a recipe chia pudding that I didn't have but was apparently amazing, at Amey's blog. We also picked up our amazing Swag Bags of Wonder! 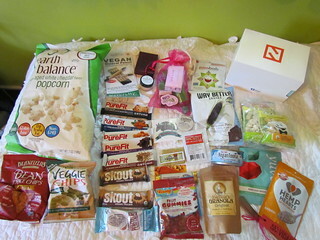 Eventually, once I make my way through it all, I will do a full post detailing each item and my thoughts, but for now here is a picture of what we got. Then it was onto the morning's talks! For the first session I went to 'The Paths to a Mindful Life' by Gene Bauer, which was a great chance to hear the founder of Farm Sanctuary talk about his life and how he finds his way to compassion in a world that so often is not compassionate. There was also a talk on at the same time by Matt Ruscigno called 'Science is Awesome: Why we don't need to exaggerate health claims about veganism. ', which I would have liked to go to as well. Thankfully Erika has done a great recap here. The next session was the hardest to choose from, because Amey was running a Zine Making Workshop that I had been looking forward to, but it ended up being at the same time as the Feminism & Veganism Panel. Ultimately I went with Feminism, but it was a harsh choice. 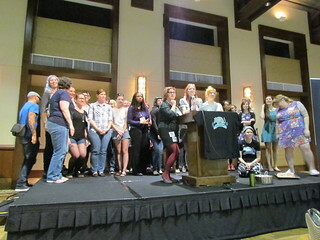 Erika has done an amazing write up of the feminism panel here. After a short break (where there were cookies, but I didn't eat them because coconut oil), I went to a talk by Sayward Rebhal on Facing Failing Health as a Vegan. 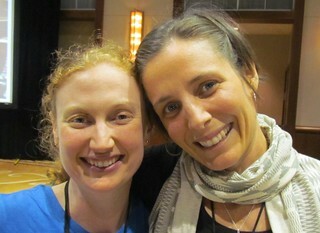 This was a great talk, with Sayward talking about facing her own health problems and the isolation she felt as a vegan with poor health, especially with the seemingly ever increasing focus in some circles on vegan as a 'health cure-all'.She has previously done a blog post on this issue here. And then there was lunch! Saturday's lunch theme was 'Vegans Heart Bowls', and even though we were given plates there was so much deliciousness to go around! 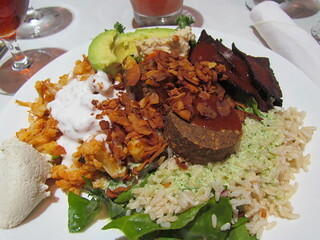 For my bwol I had brown rice, kale, spinach, chard, buffalo cauliflower with lots and lots of ranch sauce to counter the head, avocado (I love how generous they were with the avocado), some more Sweet Earth bacon, tempeh sausage rounds, coconut bacon, apple BBQ sauce, hummus and more Heidi Ho chevre. So good! For dessert there was a selection of puddings. 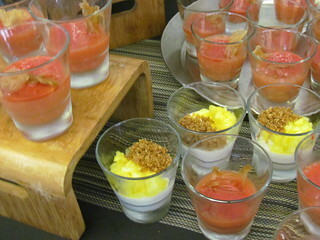 I went with the blood orange sago pudding with ginger crisp. They also had constantly refilled iced tea. 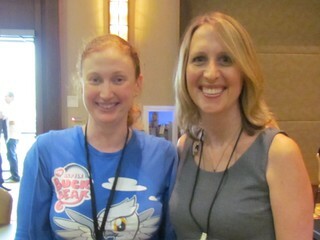 Here I am with Michelle, who goes by Food.N.Catz on Instagram and Twitter, and who did a talk on branding later on in the day. For the next session I went to a fun Food Styling Workshop run by Hannah Kaminsky, to pick up some tricks to try and make my food look prettier! She made a frito pie out of store bought ingredients and it looked gorgeous! Another talk I was interested in during this session was Preventing Ex-Vegans: Strategies to Maximise Long-term Success on a Vegan Diet by Ginny Messina. Thankfully she has done a great blog post on the subject for those who missed out! The final talk of the day that I went to was 'Can We All Just Get Along? Finding Common Ground in Different Forms of Activism: A Discussion', led by Christy Morgan. Once again, Erika has done a great recap. 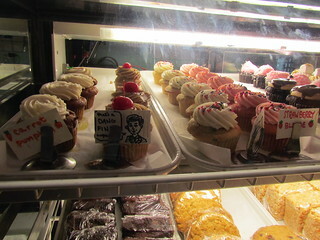 After the conference, a group of us went to Rabbit Food Grocery, which is Austin's all vegan store. I will post more about it later, but it is awesome! 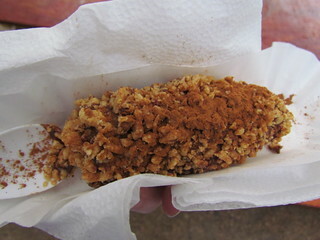 It is also near Bananarchy, which is trailer that sells frozen bananas that can be dipped in vegan chocolate. Even though it was rainy, frozen bananas are important because of potassium and also it was fun for me and Josh to say 'bananarchy' in American accents. I had a half banana, dipped in chocolate, with chopped nuts and cinnamon. It was so good! 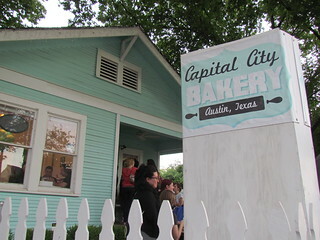 Saturday night was also the 3rd birthday celebrations of Capital City Bakery. We arrived and had to line up for an hour to get in the door, it was so well attended! Here I tried my first kolaches, which are delicious! One was ham and cheese and one was scramble and sausage. These were amazing, and so filling! Ham and cheese was definitely the best! I also had a piece of their strawberry cheesecake. Oh. My. God. I do not know what magic they do, but this is seriously the best cheesecake I have EVER had. In fact, all other cheesecake is now meaningless. 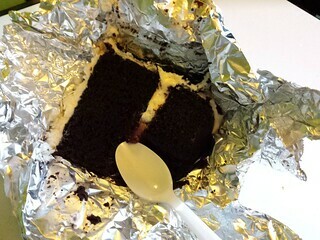 On the topic of Capital City Bakery being awesome, here is a terrible picture of a piece of chocolate cake from there I was given by Randi. Best chocolate cake of my life? You know it! 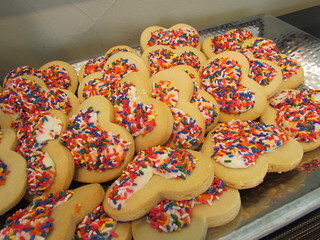 The moral of this story is that Capital City Bakery is seriously amazing. I wish I had more time to go there and eat all of the things! We should all go there and eat all of the things. Book a flight to Austin now, you will thank me! 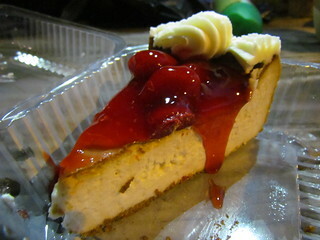 Then you will cry because you can never eat cheesecake again without remembering the best cheesecake in the world. But it will be worth it, because you will have had the best cheesecake in the world! Not to mention all their other delicious goodies. Scrunchy, the kitty at my AirBnB. 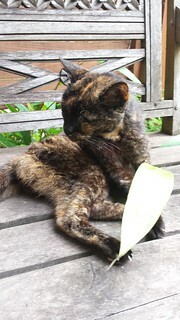 Sadly Scrunchy has since passed on, she was a very old girl. I am thankful I got to meet her.